The following article was written by Gregory Rabess and published in Dominica Vibes, Dec. 22, 2011. 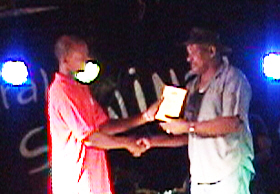 One the high points of the Waraka Séwinal Festival held in Atkinson last weekend was the awarding of a plaque of recognition to séwinal stalwart, Emmanuel ‘Bo’ Durand. Mr. Durand received the award at the Grand Séwinal Concert held on Saturday evening December 17 for his contribution to developing and promoting the séwinal tradition. He has been involved in the séwinal tradition for over forty years. 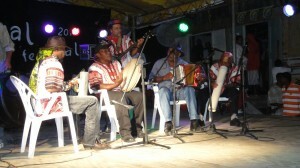 A multi-instrumentalist, Mr. Durand plays the steel pan, accordion, tanbou, gwaj and boom; typical instruments used in séwinal. The séwinal tradition runs very strong in the Durand family. His grandfather Mr. Emery Zake Durand and uncle Medland Durand and his father Rockson Durand were the leading séwinal musicians during the 1940s and 50s. According to Mr. Durand, he started ‘running séwinal’ from his teens. He recalls the use of steel pans in the late 50s as part of séwinal. He was a member of a steel pan group in Atkinson. The group went from house to house in Atkinson and the Kalinago Territory entertaining families and spreading the joy of Christmas. In more recent years, he concentrated on the accordion and tanbou, performing with his own group of musicians and with Bann Akayo. After receiving the plaque of recognition, Mr. Durand entertained the crowd with a guest performance on the accordion. The festival organizers, the Atkinson Village Council and the Waraka Séwinal Festival Committee intend to recognize other séwinal stalwarts at future editions of the Waraka Sewinal Festival. For original post: – Da Vibes. In the following article, Jon Newey pays tribute to now-deceased Ralph MacDonald. The great percussionist and composer, Ralph MacDonald, who was one of the most recorded percussionists in jazz, soul and funk as well as a Grammy Award winning songwriter, died on Sunday 18 December in Stamford, Connecticut after suffering from lung cancer in recent years. Born in Harlem in 1944, MacDonald was the son of the well-known Trinidadian calypso musician Macbeth the Great and started playing drums and percussion as a small boy. At 17 he got a job in Harry Belafonte’s steel band playing pans and percussion and stayed with him for ten years, composing Belafonte’s Calypso Carnival album in 1966. While increasingly called on for conga and percussion sessions MacDonald also becoming a prolific composer and formed a publishing company, Antisia, with songwriters Bill Salter and William Eaton. Their composition ‘Where Is The Love’ became a multi-million seller for Roberta Flack and Donny Hathaway and won two Grammy Awards, while other notable tracks by MacDonald include the Grover Washington Jr song ‘Just The Two of Us’ which also became a huge seller, ‘Mr Magic’, ‘Winelight’ and ‘Calypso Breakdown’ for the Saturday Night Fever soundtrack which also earned him a Grammy. It was however through MacDonald’s prodigious work as a conguero, steel pan player and percussionist that he became most widely known, recording sessions for over 400 albums, including major jazz names such as Roland Kirk, Gato Barbieri, Ron Carter, George Benson, David Sanborn, Max Roach, Milt Jackson, Joe Henderson, Maynard Ferguson and Paul Desmond as well as many leading funk and soul artists, including Quincy Jones, Aretha Franklin, the Brecker Brothers, Steely Dan, The Crusaders, Grover Washington Jr, Bob James and many others. He also recorded eight solo albums starting in 1976 with the acclaimed Sound of a Drum and 1977’s The Path, that traced his own musical and family roots. His most recent solo album, Mixty Motions, was released in 2007 and as ever revealed his deep and long standing interest in the roots and sound of percussion. For many years during the 1970s and 1980s the Steve Gadd/Ralph MacDonald combination was the most sought after drum and percussion section on the planet and they also played a number of special drum clinics for drum and percussion manufacturers, Yamaha, LP and Zildjian, with whom both worked on product development and education. MacDonald was always very encouraging towards other percussionists, as this writer found when he first met him in the early 1980s. In July of this year he was honoured with a Ralph MacDonald Day in Stamford. For original post: Jazz breaking news: Ralph MacDonald, the Grammy Award winning percussionist and composer, dies at 67. This youtube video features composer Ralph MacDonald on percussion during the performance of his immortal Just the Two of Us by Grover Washington. The following report of Heather Headley’s concert was written by Leiselle Maraj for the Trinidad and Tobago’s Newsday, Dec. 19, 2011. Thousands of ticket-holders packed the National Academy for the Performing Arts (NAPA), Port-of-Spain on Saturday evening to witness a stellar performance from internationally acclaimed Trinidadian songstress, Heather Headley. The singer, known for her powerful voice, was the headline act in a concert sponsored by energy company, BGTT, working in collaboration with United Airlines and Hilton Trinidad and Conference Centre. At the end of the evening, BGTT handed over proceeds of the concert to the non-governmental organisations, Foundation for the Enhancement and Enrichment of Life (FEEL) and United Way. The concert was held to raise funds for the two organisations. Neal and Massy All Stars opened for Headley, performing a mix of musical genres. A little over an hour later, they made way for Headley and her band. The Broadway star, who hails from Barataria, entertained for almost two hours beginning with her rendition of “Home” then selecting music from her own albums, “This is Who I Am” (2002), “In My Mind” (2006) and her gospel album “Audience for One” (2009). She explored her versatility, chosing music from her time on Broadway to her time spent touring with operatic master Andrea Bocelli to Calypso and Christmas carols. Headley opted to keep things mostly local, utilising the talents of Lydians’ tenor, Edward Cumberbatch; violinists, the Alternative Quartet; pannist, Johann Chuckaree; Neal and Massy All Stars and the joint choirs of Bishop Anstey’s and Sixth Form Polytechnic. After several standing ovations, Headley ended the night with a tearful rendition of “If it Wasn’t For Your Love” , a song she dedicated to the people of Trinidad and Tobago for their continued support of her career. For original report: Trinidad and Tobago’s Newsday : newsday.co.tt :. 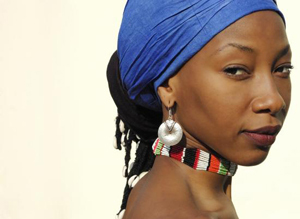 This week World Music Central features Fatoumata Diawara in its video of the week. Malian singer-songwriter Fatoumata Diawara gets her inspiration from Wassulu traditional music, jazz, and blues. She was born of Malian parents and achieved local celebrity in Abidjan (Ivory Coast) as a dancer. She moved to Bamako (Mali) in her early teens and became an actress. Diawara starred in Cheikh Oumar Sissoko’s movie La Genese. In her early twenties she moved to Paris (France) where she spent six years touring internationally with the theatre troupe Royal de Luxe. She was one of the leading actresses in the musical Kirikou et Karaba. Fatoumata Diawara recorded and toured with Malian star Oumou Sangare until she decided to develop her own music, composing, arranging and playing her own material, blending Wassulu traditions and contemporary music influences. Wassulu is an historic region in southwest Mali, northeast Guinea and northwestern Ivory Coast. Wassulu music is one of the forms of West African music that some ethnomusicologists believe to be the origin of the American blues. For original post: Video of the Week: Bissa by Fatoumata Diawara | World Music Central.org. Cesaria Evora, one of the most popular singers of all time has just died today in Sao Vicente, a city in her own country, Cape Verde. The official causes of death were cardiorespiratory insufficiency and hypertension, fact that had made her heart to stop. This is a huge loss for the international music community, as Cesaria Evora was known to be the best singers of “Morna” – type of music that is originally from Cape Verde. The most interesting part of her life is that her (recording) career started only at 47 years old, even though she had always wanted to sing. She was born in 1941 in Mindelo, Cape Verde, and she began to sing professionally 47 years later, in 1988, with the help of another singer from the country she was originally from. Her first concert was on October 1st, 1988, in Paris, in front of a small crowd. However, due to her unique voice and charisma, from that moment, she started to gain more and more popularity. 1. 1993: she releases “Miss Perfumado” in France, which is a huge hit, with more than 300,000 sold and concerts all over the year. 6. 2011: she retires from her professional career, and dies on December 17, 2011 in Sao Vicente, a city in her own country, Cape Verde, due to cardiorespiratory insufficiency and hypertension. Rest in Peace. God has now another soldier for his army. For original post: Cesaria Evora Died Today. Paris, France — We are often defined by a number of important cultural and linguistic attributes. Jamaicans, what is our race? What is our ethnicity? And our language…? Indeed our language is not only a technical instrument of communication, it is the vessel which holds our heritage and identity and as such is worthy of respect and recognition. However, Jamaican Creole is not an official language even though it is the main form of communication in many homes and social spheres in the country. If Creole is not an “official” language then what message are we transmitting to its speakers? That they are somehow lesser citizens than speakers of English? Besides, this lack of status for our lingua franca is in fact a vestige of Jacobinism. Unfortunately, many Jamaicans continue to believe that because English is an international language it should dethrone the Jamaican Creole. While it is clear to all that Jamaica needs to shed insularism and that in this respect English is an invaluable tool, we shouldn’t envision an either/or solution. Indeed, monolingualism is actively encouraged by globalisation and therefore whatever indicator for language competence you use, it is true that we tend to assume rigid positions on language teaching/learning based on those underlying socio-political and economic realities. The fact, however, is that we received English as a part of our slavery and colonial heritage, it was imposed. Jamaican Creole on the other hand is a 100 per cent local product. Its birth being a result of the unique mix of English and West African languages such as Fante, Igbo, Wolof, Yoruba and Twi, many of which are no longer spoken in their original forms. All the more reason for the Creole to be valued and preserved. In this effort, there should be unity among all Jamaicans about the safeguarding of our lingua franca, because a non-Creole Jamaica is a false concept which would devalue the core identity of the island. In order to achieve that consensus though, it seems to me that a change in mentality is a necessary prerequisite. Cacophony or symphony in Europe? The European Union which represents 450 million people now has 21 official languages. Although that reality costs a fortune in interpreting and translation services, the Union wants to remain faithful to its motto which is ‘United in diversity’. Old European languages like Lithuanian (2.96 million native speakers in Lithuania) or Luxembourgish (320,000 speakers and it is not one of the 21 official languages of the Union) are preserved and protected within the context of this European linguistic diversity. Indeed, in Barcelona in 2002 EU leaders committed to a ‘Mother tongue plus two’ principle which ensures that the children here learn at least two foreign languages in addition to their mother tongue during the course of their schooling. This explains in part why tiny nations like Finland, Corsica, the Netherlands and Sweden maintain, support and teach their local languages in schools and still manage to produce students who, for the most part are fluent in at least one other European language. Voulez-vous parler au monde? Do you want to talk to the World? Yuh waan fi chat to di worl ? I did not learn to write the Jamaican Creole in school. This is a pity because a comparative analysis of Creole and English structures would help to prevent unfortunate illusions typified by the now infamous outburst of a Jamaican woman who exclaimed some variant of the following: “A wa unoo a sey? Unoo no see sey a Henglish mi a chat!” Indeed if we are really concerned about the nefarious impact of globalisation and the role that language deficiencies may play in our marginalisation then, instead of trying to eliminate Creole, we should promote active, structured bilingual or even trilingual education in our schools. To this end, Dr Hubert Devonish spearheaded the very ambitious and proactive Bilingual Education Project which aims to provide answers for a new framework strategy for the official use of both languages in our primary schools. The results of this pilot project are very promising. Indeed, teaching our children both Creole and English at school will valorise their first language (for many, Creole is indeed their first language), while providing scaffolding which will make the acquisition and mastery of English that much more attainable. In this way they will be able to enjoy the social, economic and cultural rewards of English without shedding their identities in the process. Our education stakeholders should therefore pursue the recommendations set out in this project in order to produce students who are truly bilingual and at peace with their local language. Even though I readily admit that the co-existence of both Jamaican Creole and English in the same geographical space can be challenging, we should accept that culturally and linguistically all languages are equal. Accepting this fundamental truth should prevent us from fighting the wrong battles. Creole should have pride of place in our society and should unite us; it should not be the object of divisions and discord. Our language policy therefore should enshrine the principle of the cultural, historical, human elements of our two languages. The original post can be read at: A non-Creole Jamaica is a false concept – News – JamaicaObserver.com. The following youtube video is an excerpt from a monologue by Jamaican cultural icon Louise Bennett that addresses the issues raised in the preceding article. The following is the statement of Yolanda Lezama Clarke, President of the West Indian American Day Carnival Association. This is her response to reports of offensive comments made on Facebook by members of the NYPD, about the Carnival and the West Indian American community. It was published in Caribbean Life, Dec. 11, 2011. Hearing and reading about these remarks made by NYPD officers, “animals, savages, bomb them” was truly disappointing, however, not surprising. While these are the views of many, I am sure that does not reflect all of the administration. These are gross, irresponsible descriptions that undermine the mission and purpose of the event. WIADCA is grateful for the ongoing long-term support of the Mayor’s Office, Commissioner Kelly, the NYPD and all of those officers who assist in the Labor Day parade, carnival and events. There are many NYPD officers that believe that our community, similar to so many other New York City parades and events, is simply having a wonderful time in Carnival song, dance, music and art. They also know and believe that WIADCA’s families, participants, supporters and children are expressing the performance, joy and exuberance of Carnival. WIADCA is the largest parade and carnival in the city and a significant economic component of revenue for both the city as well as New York State. The positive economic impact on New York’s large and small businesses is unparalleled. The hotels, MTA riders, restaurants, and other tourism -supporting components of the city would suffer greatly without the Labor Day event. Carnival is supposed to be a euphoric experience that is enjoyed by all who attend, police included. It is meaningful and brings together many friends and family members from “back home” every Labor Day in a reunion filled with music, island food, and beautiful costumes. The difference with this Carnival is that it is celebrated by many of the islands where Eastern Parkway comes alive every Labor Day with representation from Trinidad & Tobago, Jamaica, Haiti, Barbados, St. Vincent, St. Lucia, Grenada, and even Panama. This carnival has become a celebration of over 2.5 million people, which also speaks volumes about the funds it contributes to the city’s coffers. We are extremely disappointed to learn about the Facebook page set up by some NYPD officers that maligned not only the Labor Day event but also the participants and members of our community. The language and expressions used to characterize our community members is both racist and volatile and cannot be characterized in any other manner. In addition, in sharp contrast to the current official reactions to any and all terrorist-type comments and actions, the comment such as: “I say have the parade one more year and when they all gather drop a bomb and wipe them all out,” would not be tolerated in any part of New York. It would not be tolerated on New Year’s in Times Square, it would not be tolerated at the Macy’s Thanksgiving Day Parade, it would not be tolerated in Central Park. NO EXCEPTION can be made. It cannot be tolerated on Labor Day. If these statements are true, it justifies the need for more cultural awareness. When segments of our community, especially those who are supposed to protect our youth express these feelings and sentiments regarding other groups, then we need more effective dialogue, because it represents the most obvious need. The fact that there are members of the New York community who are sworn to protect the rights of New York citizens and who function as role-models for our children, in 2012 would express such vile and historically racist beliefs, is greatly disturbing. Any culture of police officers’ contempt for New York’s Black and Brown communities — either real or symbolic, cannot be tolerated. We are calling on our elected officials and communitiy leaders to support our effort to end any and all police contempt towards members of our community. We are calling on Mayor Bloomberg, Commissioner Kelly and Public Advocate Bill DeBlasio for an immediate meeting to assist us in rooting out all volatile racist behavior and attitudes from members of our NYPD. One medium could be a “wellness over violence initiative” to heal and address these types of concerns in order to bring us closer together, as a community and a nation. In 1826 Thomas Jefferson passed away and stated that he was leaving the issue of race relations for another generation to solve. Did he mean 2012? Must it take so long for us to live up to the ideals of the founding fathers of this great nation? If we choose to become a leader when will we completely grow into our own ideal and can we bring these members of the NYPD along? Neither the violence exhibited within the community due to various socio-economic ills facing people of color, or the violence against the community, including external and internal aspects of racism, can be accepted in any form. Today’s words become tomorrow’s bullets. It cannot be allowed to exist anywhere, any longer. President, West Indian American Day Carnival Association. For the original post: Disappointed at NYPD cops’ Facebook comments • Caribbean Life. The following article, written by Andy Morgan, was published in The Observer, Dec. 3, 2011. Cowering under a statue called Belgium Bringing Civilisation to The Congo, one of four golden effigies in the entrance hall of the Royal Museum for Central Africa in Tervuren, near Brussels, there’s a sculpture depicting a miserable African native, naked and blatantly “savage” in the estimation of its colonial creator. For a moment before our interview, Baloji, one of the most innovative rappers and video producers to have emerged from Africa in recent years, loiters near this ludicrous pairing, tall and pensive in his two-piece suit of dark blue plaid, peach pink shirt and Puma trainers. It’s a telling trinity: the pompous European “father”, the colonised African “son” and Baloji, “the sorcerer” (the meaning of his name in Swahili), standing there all cool and dapper, like the embodiment of a young and ambitious Africa. Baloji is due to start filming his next video, a radical Congolese reworking of the Marvin Gaye song “I’m Going Home”, in the vaults of the museum. He’s even persuaded the museum to part-fund the filming, a monumental feat in itself. Baloji is a fighter and few other African artists demonstrate such bone-headed tenacity in their battles against indifferent record labels and scoffing managers. “What takes two weeks for Kanye West takes me a year,” he says. Once a member of Starflam, one of Belgium’s most successful hip-hop crews, Baloji began to plough his own furrow in 2007, when he released his first solo album, Hotel Impala. In 2010, he was named one of the year’s breakthrough acts by the influential DJ Gilles Peterson and earlier this year he joined Damon Albarn’s Africa Express. He’s currently limbering up for the worldwide release of album number two, Kinshasa Succursale. It’s an ambitious attempt to marry rap with a glittering casket of African and African diaspora styles, from mellifluous soukous through funk and ragga to the raw sound of traditional urban Congolese music. Some of the songs on Kinshasa Succursale are reworked versions of tracks on Hotel Impala but most are completely new. It could almost be the Congo’s answer to the Beatles’ White Album, a favourite of Baloji’s. In fact, several tracks, including the otherworldly “Karibu Ya Bintou”, which rides an alien riff by Kinshasa’s finest, Konono No 1, are unlike anything that has emerged from Africa before. But it’s Baloji’s videos that reveal the true extent of the man’s creative power. Self-funded, filmed on location in the Congo by the Belgian directors Spike & Jones and cameraman Nicolas Karakatsanis, Baloji’s video clips for the songs “Le Jour d’Après” and “Karibu Ya Bintou” are mini-masterpieces that draw power from his fascination with cinema and photography (his cousin Sammy Baloji is a well-known Congolese photographer). Despite suffering from the rampant racism of smalltown Belgium – he was almost deported back to the Congo at the age of 20 – Baloji can thank his adoptive country for the eclecticism of his style. Until recently, however, he hated most African music, especially Congolese soukous, the bedrock style of post-independence pan-African pop. “For me, it was the worst music in the world,” he says. Nonetheless, when he received a letter from his mother out of the blue, in 2007, his Congolese heritage came back into his life with a vengeance. It inspired Baloji to return to his roots and record an album – a kind of soundtrack without a film – to tell his mother what his life had been like over the past 20 years. That is how Hotel Impala was born. It’ll take a special kind of musician to conjure up that mix of heritage, modernity and blistering lyrical flow, a style that values Africa’s past but is also somehow free of it. It’ll take a real baloji perhaps; tall, dapper and fearlessly stubborn. 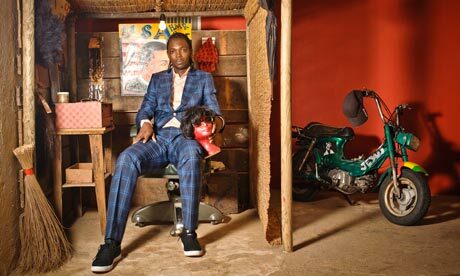 For the original posting: Baloji: ‘I want to make music that is very African and very modern’ | Music | The Observer. The Honorable Jimmy Cliff has been a reggae legend for nearly 50 years. The EP Sacred Fire, his first studio release in seven years, finds him strong and passionate and capable of touching hearts and minds as effectively as always. Cliff is the only living musician to have received Jamaica’s Order of Merit, the country’s highest award for achievement in the arts and sciences. His commitment to social justice and unflinching desire to expose issues such as economic instalibity, war, and political hypocrisy shine through strongly on these five songs, which were produced by Tim Armstrong, who is known for his work with Operation Ivy, Rancid, and The Transplants. Armstrong gives the music a fresh sound while giving full respect to Cliff’s deep reggae roots. “Jimmy is one of my musical heroes and I’ve been responding to his music my entire life,” explains Armstrong. I especially love Cliff’s fantastic version of “Ruby Soho” and his original song “Ship is Sailing,” with its message of overcoming any obstacles with love and determination, a message reggae delivers more effectively, I think, than nearly any other kind of music. It is an important counter, too, to the heavier messages of the other songs on this CD. There is also a wonderful version of “A Hard Rain’s Gonna Fall” that I know Bob Dylan, who has called Cliff’s “Vietnam” the best protest song ever, must love. Shot down on the pavement, or waiting on Death Row? “These songs are about the sacred fire inside of me. As an artist and activist, I feel I have more to accomplish. The fire is still there,” Cliff explains in the press release. Yes, the fire is certainly still there. This EP is a little taste to get us all ready for a full CD and tour coming in early 2012. Grab it–it’s a small treasure in its own right. I can’t wait to hear the full CD! For original post: Music Review: Jimmy Cliff – Sacred Fire – Blogcritics Music.